TC-WinstonThe devastation Tropical Cyclone Winston unleashed on Fiji is still a reality for many across the country. To explore how Fiji’s National Disaster Management Office (NDMO) responded, and what could be improved upon for next time, a series of Lessons Learned Workshops will be held over the next four weeks, beginning in the Northern Division of Fiji today. 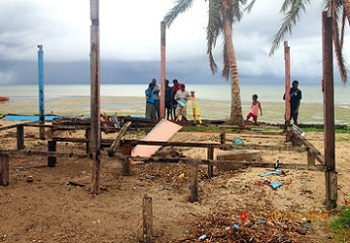 Parts of the Northern Division of the country were badly affected, with many communities in the direct path of Cyclone Winston, the strongest recorded cyclone in the Southern Hemisphere struck land on 20 February. The Lessons Learned Workshops are funded by the €19.37 million (FJD 45 million) ACP-European Union Building Safety and Resilience in the Pacific Project implemented by the Pacific Community (SPC). This workshop is the first in a series of six planned across the country that will culminate with a national lessons learned workshop. The teams responsible within the NDMO for preparation, response and recovery will all be participating in the workshops, along with the Mata-ni-Tikina (community representatives), United Nations agencies, non-government organisations and community members affected by the devastation of Cyclone Winston. The European Union Ambassador to the Pacific, H.E. Andrew Jacobs, commends the NDMO and its Director for their dedication to improving disaster resilience and preparedness in Fiji. “The European Union is committed to supporting Fiji recover from the impact of cyclone Winston. We also recognise the dedicated response by the NDMO team and the EU supports the improvement of response and the preparedness of communities for future natural disasters,” he said. The NDMO Director, Akapusi Tuifagalele, said the partnership from both the EU and SPC is helping ensure the country can respond to future disasters in an even more coordinated way. “We are being extensive in understanding where we did well and how we can do better for the communities of Fiji,” Mr Tuifagalele said. SPC’s Project Manager for BSRP, Taito Nakalevu, said this work, along with previous lessons learned workshops in Vanuatu after Cyclone Pam, will form a benchmark for how the Pacific can respond better to disasters in the future. The ACP-EU Building Safety and Resilience in the Pacific project (BSRP) is a €19.37 million project funded by the European Union and implemented by the Pacific Community (SPC). The objective of the project is to reduce the vulnerability, as well as the social, economic and environmental costs of disasters caused by natural hazards, thereby achieving regional and national sustainable development and poverty alleviation in ACP Pacific Island States. ACP refers to Africa, Caribbean and Pacific.